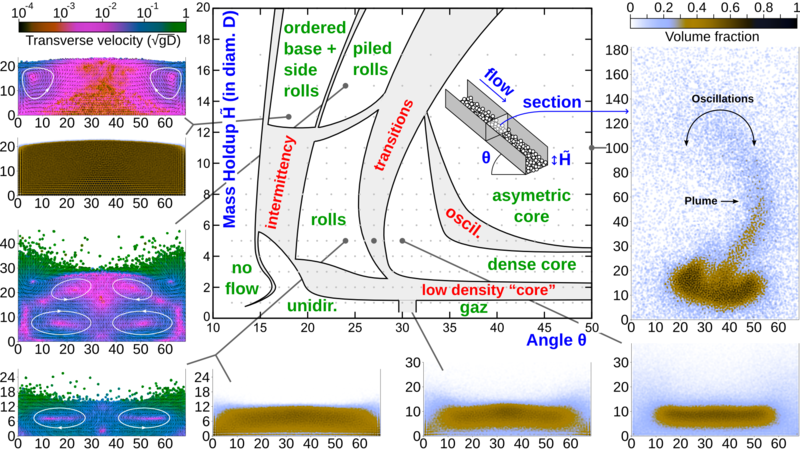 Phase diagram and some snapshots of granular flows. Imagine the side and base of each image are these of a canal, seen from the front, with the grains flowing towards you. The grains volume fraction and velocities are shown with different color maps. See the article for the full explanation. See also my vector and scalar field plotter if you are looking for a software that can produce such pictures. I introduced virtual glass spheres in a computer model of an inclined channel. Such channels are quite common in the industry and they represent a simplified version for some natural flows. Simulating them allows to slow motion, to monitor each grain movement, to have a fantastic insight of what happens inside the flow, which is nearly impossible to do concretely (but maybe not completely impossible :P). Note that this is a very simple configuration: one flat base and two flat side walls, the whole thing inclined at some angle to let the grains roll down. But as simple as that basic configuration may be, it has shown very surprising and unexpected behaviors for the grain flows. In some configurations the grains appear to concentrate on a dense slab that "floats" on top of some other very agitated grains, therefore travelling long distances with little effort, as if on an air cushion. In some other configurations the grains do not roll directly toward the bottom, but instead slide and roll up on the sides, creating vortices that spiral down. In the center of the above pictures is a phase diagram, a way to graphically represent what can happen when the angle is changed, and when more grains are added to the system. Only two parameters, yet a great diversity of behaviors. What if we simulate corn grains instead of glass beads (changing in this case the shape and the material properties)? What if we add water between grains of sand? As useful these simulations could be for understanding natural phenomena (ex: erosion) or for optimizing industrial processes, they remain very hard to implement correctly and run in a reasonable time. Yet, computers are currently the only way to solve these equations. We report on new patterns in high-speed flows of granular materials obtained by means of ex- tensive numerical simulations. These patterns emerge from the destabilization of unidirectional flows upon increase of mass holdup and inclination angle, and are characterized by complex internal structures including secondary flows, heterogeneous particle volume fraction, symmetry breaking and dynamically maintained order. Interestingly, despite their overall diversity, these regimes are shown to obey a universal scaling law for the mass flow rate as a function of the mass holdup. This unique set of 3D flow regimes raises new challenges for extending the scope of current granular rheological models and opens new perspectives for interpreting the features of geophysical granular flows. The source code is maintained in my source repository, check it for updates. The latest version can be downloaded either as a tar.gz archive, or by using GIT: git clone git://nicolas.brodu.net/dymo. You will need a recent C++ compiler as well as a few of the most common support libraries (boost...).